Vallas Apartments is located in Firostefani, just a few steps from Fira and a short drive from the port and the airport. 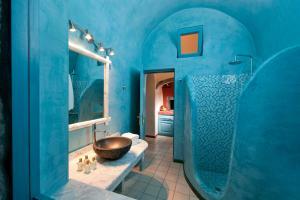 It has tastefully decorated rooms, some with views of the Aegean Sea. Please inform Vallas Apartments & Villas in advance of your expected arrival time. For this, you can use the special requests section when making the reservation or contact the accommodation directly. The contact details appear on the booking confirmation. 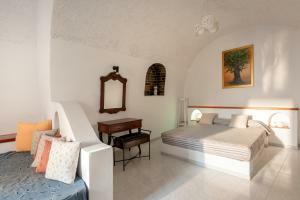 Air-conditioned apartment with a private entrance, sofa and LCD TV. It has a separate bedroom and a kitchenette, equipped with a fridge, electric kettle and coffee machine. It has a balcony overlooking the garden. - 2 living rooms with sofa bed, TV and music channel. 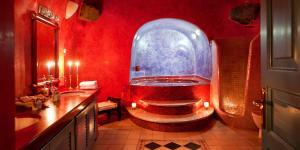 - 2 bathrooms with whirlpool tub. 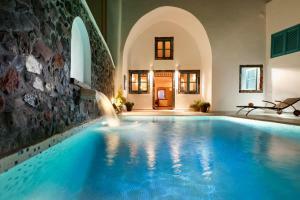 This exclusive open-plan villa has a private pool, 62 m² porch and a spacious indoor hot tub. It offers total privacy, at the same time as the best views of the cliff. This exclusive open-plan villa has an outdoor hot tub and a terrace. Guarantees privacy and the best views of the cliff. This house has a balcony, private entrance and electric kettle. This suite features air conditioning, electric kettle, balcony and access to a shared outdoor hot tub. This suite features a balcony, private entrance, air conditioning and access to a shared outdoor hot tub.